System integration is in the core of the Ometa framework. In order to set up no-code integrations between various systems, Ometa has multiple pre-built connectors that are ready to use. In addition, the Ometa framework has been developed in such a way that it is very easy to add new connectors in a very short time. The fact that we are able to translate data into an open structure, offers us a tool set that can be used independently from external systems. This makes Ometa an integration platform that can be deployed in a flexible way in order to set up both planned synchronizations as well as realtime integrations. With the synchronization module you can keep a source system in sync with a target system. The Ometa framework can connect to different systems which are available in the synchronization module. The configuration is done through a wizard. This means that setting up a synchronization is very simple. The synchronization engine operates based on events that are performed when a new item is discovered in the source system, when an item has been modified, when an item has been deleted and even when an item remains unaffected. 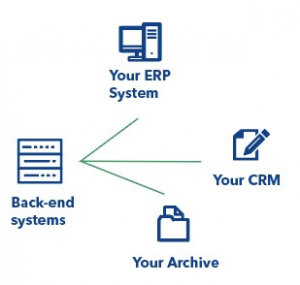 Not only can the synchronization module be used for synchronizing records, but also for documents. By using the scheduler you can run these synchronizations at any time of the day, week, month or year so that all systems remain synchronized at all times. Besides scheduled synchronization, Ometa also provides realtime integration. We are able to disclose the APIs of your current systems and bring all data towards an open standard via OData. OData (Open Data Protocol) is an ISO/IEC approved, OASIS standard that defines a set of best practices for building and consuming RESTful APIs. OData helps you focus on your business logic while building RESTful APIs without having to worry about the various approaches to define request and response headers, status codes, HTTP methods, URL conventions, media types, payload formats, query options, etc.